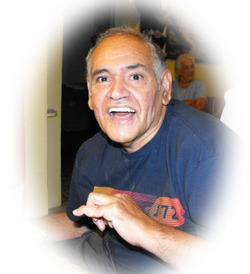 Anselmo Herrera Calvillo of Jourdanton, passed away May 9, 2018 at the age of 64. He was born November 6, 1953 in Pleasanton to Jose P. and Adelina (Herrera) Calvillo. Anselmo is survived by his brothers, Christopher Calvillo and wife Beatriz of San Antonio and Jerry Calvillo and wife Stella of Converse and sister, Beatrice Trevino and husband Jimmy of Jourdanton. He is also survived by his nieces and nephews, Rachel, Serena, Sybil, Vanessa, Ronda, Tonya, Brandise, Matthew, Jacob and Christopher. Anselmo is preceded in death by his parents, Jose and Adelina Calvillo and brother, Joe H. Calvillo. Visitation was held on Monday, May 14 from 2-9 p.m. at the Hurley Funeral Home in Pleasanton, with a rosary recited at 7:00 p.m. Funeral services were Tuesday, May 15 at 10:00 a.m. at St. Andrew Catholic Church in Pleasanton. Burial followed the mass at the San Ysidro Cemetery.